You simply can not ignore bleeding gums! They may be a sign of gingivitis, a gum disease which, if left untreated, can cause serious problems, pain and money! In fact, more people lose their teeth due to gum disease than from tooth decay! So if your gums are bleeding, you need to seek prompt treatment by calling Ian Barwick, DMD at (978) 957-5511 to schedule an immediate appointment. Bleeding gums can be prevented with excellent home care. 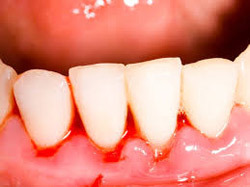 Infection, injury, or inflammation is the usual cause of bleeding gums. Sometimes pregnancy will cause gums to bleed as well. If you don’t brush or floss properly, a thin layer of plaque can form at the gum line. Gingivitis, or swelling of your gums, can quickly set in, causing the initial bleeding.